Downtown Fort Myers just minutes away! This is likely the nicest unit in Schooner Bay!!! GORGEOUSLY REMODELED- bathrooms, kitchen, floors!!!! 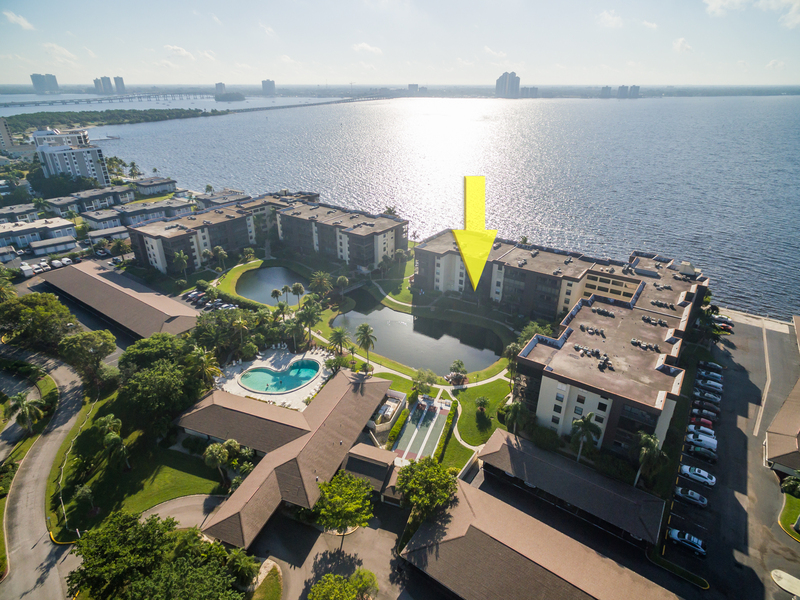 Offering serene & gorgeous views of the community pond & resort-style swimming pool, this unit offers entry via the patio & the front door. The second bedroom has a slider & french doors allowing it to work as an open den when not being slept in… making the living space that much more useable! Huge walk in closet in the master bedroom. A super easy walk through the gorgeous grounds from your carport, you can completely avoid entering through the building if you desire. HUGE LANAI which features ELECTRIC ROLL DOWN HURRICANE SHUTTERS and additional storage closet. BEING SOLD TURN KEY- just walk in, turn on the tv and call yourself home. Everything you see is included in the purchase price. Schooner Bay is a fantastic community boasting a resort style pool, fishing pier & dock, community room, shuffle board, fully equipped fitness room, sauna & convenient access to many of N Ft Myers waterfront restaurants, which are just a short walk away. You will love the front row seats for the fireworks display over the 4th of July. This unit is a must see. Schedule your showing today!